Food Adventures of a Comfort Cook: Anticipating a new adventure with a wild creature. Anticipating a new adventure with a wild creature. Tomorrow, for the first time, I will be cooking and eating Elk. I did attempt deer (venison) once, but it was a disaster. The person who had given me the deer meat did not give me any instruction on preparing it. In my ignorance, I killed the poor beast once again. I expect this new attempt at serving a wild animal to come out much better. The gentleman, an avid hunter, who had given me the Elk meat, gave me very good instructions on preparing the meat. I just happen to have a mushroom and onion gravy recipe that I’ll pair with the steaks; making it, of course, in the same pan the steaks are cooked in. So Charlie, thank you so much for giving me the tools (Elk meat) to jump into this new adventure, and I hope I do you proud. Of course I’ll be writing about the results in another blog post; that way everyone will know how I did. Actually, I’m not surprised that I’m going to attempt this; let’s face the truth, I’m a carnivore for the most part. Vegetables are side dishes that are way off to the side, but I do love potatoes: mashed, boiled, roasted, fried, baked, and any other way they can be cooked up. Yeppers, a real meat and potatoes woman am I. 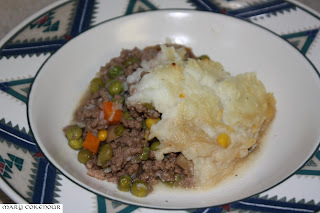 One of my favorite meals is either Shepherd’s Pie or Cottage Pie. Now you may have heard of Shepherd’s Pie which is made with ground lamb, but did you know that its counterpart is actually made with ground beef, so called Cottage Pie? I have made, and enjoyed both, and can say I do not prefer one over the other. The origin for both is vague; the Irish, Scottish and English all say they came up with it first, and that is one debate I intend to stay out of. Traditionally, either pie is made with white or Yukon Gold potatoes, but sweet potatoes can give the dish an entirely different flavor. No matter which kind of potato is used, Shepherd’s and Cottage Pies will be the quintessential comfort food. Shepherd’s Pie is made with lamb, while Cottage Pie is made with beef; all the remaining ingredients are the same for both. In a large skillet, high heat, brown the meat and drain excess oil. Add the onion and mushrooms, letting cook till the onion softens. Add tomato and Worcester sauces, frozen vegetables, herbs, pepper, flour and beef stock; mix thoroughly and bring to a boil. Reduce heat to low and let simmer for 15 minutes. While meat mixture is simmering, boil the potatoes in salted water until tender. Drain and mash the potatoes, add butter, milk, grated cheese and pepper to the potatoes. Preheat oven to 375F. In a 3 quart rectangular baking dish, spread 1/2 potatoes on bottom of baking dish; spread out the meat mixture; top with the other 1/2 of potatoes; sprinkle paprika over top. Bake for 30-40minutes; potatoes should be lightly browned, and the pie heated thoughout. This recipe was chosen and featured in the Better Homes and Gardens Magazine, March 1999 issue. 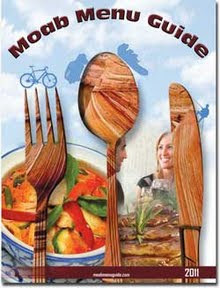 It also appeared in the Better Homes and Gardens “Annual Recipes” cookbook, 1999. Peel and cut up sweet potatoes. Cook in a small amount of boiling water, just enough to cover, for 20-25 minutes, or until tender; drain. Mash potatoes; add milk, salt, ½ tsp cinnamon and nutmeg; set aside. Preheat oven to 350F. In a large skillet, cook lamb, mushrooms and onion together until there is no longer any pink to the lamb meat; drain excess fat. Stir in wine and savory; cook for 1 additional minute and remove from heat. Spray a 2 quart casserole dish with nonstick spray. 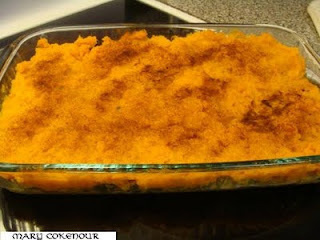 Spread 2/3 of the mashed sweet potatoes over the bottom and up the sides of the dish. Fill center with lamb mixture; top with remaining 1/3 of potatoes, spreading evenly over filling and to edges of dish. Bake for 20 minutes; sprinkle orange peel and remaining ½ tsp cinnamon over top; bake an additional 15 minutes.